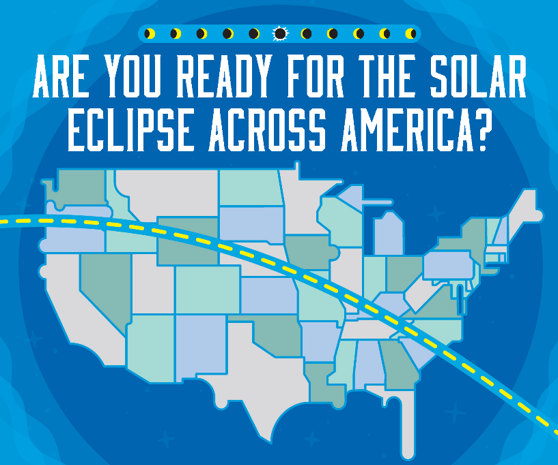 Safety for the Eclipse on August 21st! - HEALS, Inc.
On Monday, August 21, 2017, all of North American will be treated to an eclipse of the sun. Looking at the sun is always dangerous without proper protection. My recommendation and the safest way to view the eclipse is by watching it on TV. If you truly want to view it in person, the only safe way to look directly at the un-eclipsed or partially eclipsed sun is through special-purpose solar filters, such as “eclipse glasses” that are labeled as ISO12312-2. If your children must participate, make sure you are standing next to your child to assure the special NASA approved glasses are on. Your children should keep the glasses on the entire time (no peaking around them)! Viewing it without proper solar filters can cause solar retinopathy that can cause irreversible vision loss. We are very protective of your little ones eyes especially while they are still developing! The safest way for your children to view the eclipse is on TV to assure no damage to their little eyes. Please be safe – we only have one set of eyes! 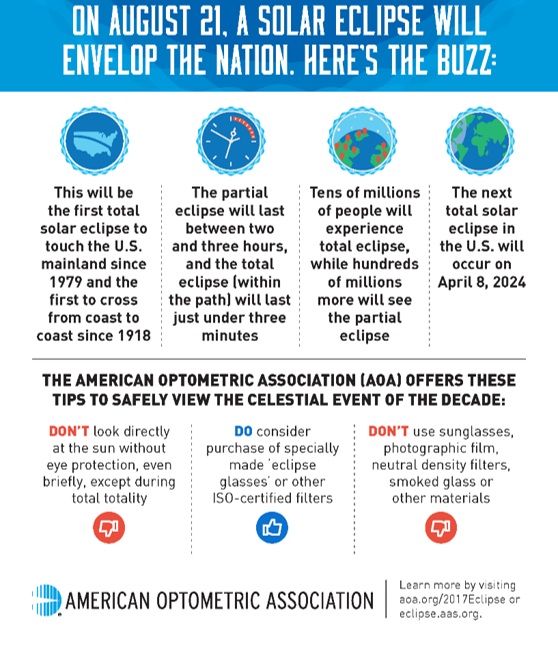 Please check out the graphic below to see more details on the eclipse and the recommendations of the American Optometric Association. Enjoy the excitement, but above all, be safe!